The Lamborghini name is well known to motoring enthusiasts everywhere, but not too many have driven these cars, or even seen one in the metal. Unlike Ferrari, Lambo’s are fairly thin on the ground. I have been fortunate to have driven a few Lamborghini’s, but have to admit I have had somewhat of a love-hate relationship with them. However, the Miura will remain an important piece of automotive history, as it was the first transverse engined V12 supercar of the day – and that was 1966. The chassis was reminiscent of the Ford GT40, itself a development of Eric Broadley’s famous and radical Lola GT Mk VI. But it was the body design that stunned the world in 1966. Bertone was commissioned to design the shell and it was done by Marcello Gandini (who also designed the Diablo), who was then only 25 years old. 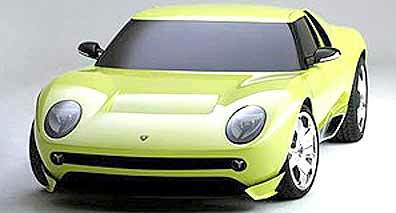 The signature for the Miura design in my opinion was the ‘eyelashes’ around the headlights. Something never seen before. This ‘new’ car is the work of Audi’s head of design, Walter de Silva, and the Miura Concept is apparently a faithful reproduction that has been redesigned in every aspect. Again, according to Lamborghini, Walter de Silva has “retained the extraordinary purity of line characteristic of the original” but refined the contours and eliminated “any superfluous detail in order to enhance the clean, simple lines and perfectly-balanced proportions of the original.” Unfortunately, in that enhancement, the eyelashes seem to have been lost. Great shame! The production original is 40 years old this year, prompting de Silva to mark the occasion with the concept. 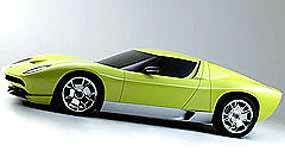 “Over the last two years I have often dreamt of redesigning the Miura. Now, thanks to my new position at the head of Lamborghini design and the enthusiastic support of the Lamborghini CEO, I have been able to turn that dream into a reality,” he said. The original Miura was displayed as a concept at the Turin motor show in November 1965 before debuting in production form at the 1966 Geneva show the following March. It remained in production until 1972, after 762 had been built. The Detroit Show certainly brought out the heavyweights in the auto industry, with Mercedes-Benz unveiling its new S65 AMG, which DaimlerChrysler claim is the world’s most powerful series-production car. That claim is probably correct, because the new S65 AMG delivers 450 kW and has a peak torque figure of 1000 Nm – more than any other vehicle in its segment. Its ultra-powerful AMG 6.0 litre V12 biturbo engine has been further worked upon to produce the shattering performance that this S-Type saloon can return. Try zero to 100 km/h in 4.4 seconds and 0 to 200 km/h in just 13.3 seconds but it has an electronically controlled top speed of 250 km/h. The 12 cylinder biturbo engine uses motor racing know-how to give the car a power figure of 450 kW from 4750 to 5100 rpm, while the maximum torque of 1000 Nm can be called on from 2000 rpm to 4000 rpm. Even as low as 1000 rpm, the AMG V12 biturbo engine already delivers 570 Nm of its available torque, while 750 Nm is on tap at 1500 rpm. That’s the kind of torque figures that would allow you to tow the Mandarin Oriental Dhara Dhevi Resort down Sankampaeng Road! The AMG V12 has a precision-balanced crankshaft made out of high-strength alloys, forged pistons made out of special material that is extremely resistant to temperature and pressure, a more effective oil-spray cooling system with a separate individual nozzle for each piston plus larger piston pins. The main and big-end bearings are also made out of improved materials to compensate for peak temperatures and pressures more effectively. The S65’s styling is understated, as all the AMG variants are, but has pronounced flared wheel arches, a redesigned AMG front apron with enlarged air intakes while two slanted struts and integrated round fog lights set in chrome rings make the S-Class look even wider and lower. According to the Automotive News correspondent who has seen it in the metal, the discreet side skirts emphasize the dynamic feel of the side view; all reinforced through the “V12 biturbo” lettering on the front mudguards. 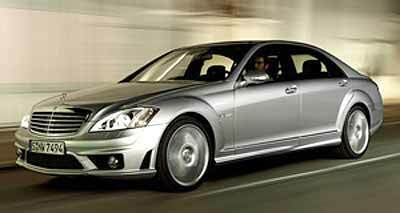 The standard specification list is also long and includes a new AMG sports suspension based on Active Body Control, unmistakable AMG body styling, multi-piece 19-inch AMG light-alloy wheels, Mercedes five-speed “Direct Select” gearshift with AMG steering-wheel gearshift paddles as well as a new AMG main menu with racetimer. All this will set you back around (my guesstimate) 35 million baht, but don’t shoot me if I’ve got it wrong. Whatever, it will be out of my price range! Last week I mentioned that in 1968 two turbine driven cars looked like winning the Indy 500, but with nine laps to go, both cars retired. I asked what was the cause, and why did they not run in 1969? The reason was that both their fuel pumps gave up at the same time. The reason they did not run in 1969 was because the turbines were outlawed for that year. So to this week. Since we have mentioned the Audi owned Lamborghini marque, think back to the Diablo, which was released in 1990. For my money this was probably the most flawed Lambo ever built, and the thumping and banging suspension (or lack of it) probably gave me a bad back for life. But didn’t it look great! When the Diablo was built, the design and development costs were reputed to be USD 84 million. Who picked up that bill? I had a mate in Australia who raced a motorcycle. Like all riders involved in motorcycle racing Down-under, you got given a nickname. Mine was “Sawbones Sam” and I’ll tell you why over a beer one day – you’re buying. His was “Autumn leaves”. The reason? Because he was always falling down! If you are interested in gaining better skills, or just have had the burning desire to throw your leg over a race bike, there is now an opportunity available for you. HighSide Tours, run by an affable Brit Graham Knight, can show you the way round the Bira circuit outside Pattaya. The costs are very reasonable starting at B. 16,000 for one day, and I suggest you check the website www.highsidetours.com to get more details. An oil-burner for Le Mans? Audi has recently revealed an all-new diesel-powered Le Mans 24 hour race challenger. 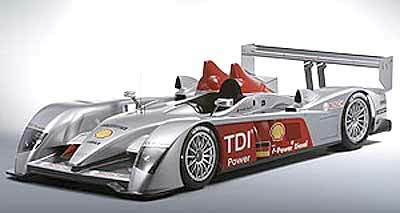 The V12 TDI-engined racer will go by the name R10 and replaces Audi’s very successful R8 Le Mans prototype, which notched up 61 wins - including the Le Mans 24 hour five times and the American Le Mans Series (ALMS) six times in succession. The R10’s 5.5-litre 485 kW twin-turbo diesel, which produces an enormous 1100 Nm of torque, makes Audi the world’s first car maker to try for a Le Mans victory with a diesel-powered racecar. The power produced by this Audi diesel is quite mind-blowing, with the 5.5 liter eclipsing the AMG 6 liter (item above) with its 450 kW and 1000 Nm (see S65 AMG item above). Featuring two diesel particulate filters, common-rail fuel induction and injection pressure exceeding 1600 bar, the 90 degree, 48 valve DOHC V12 offers peak power between just 3000 and 5000 rpm, while its 1100 Nm torque peak required a chassis rethink for the R10, whose carbon-fibre monococque frame employs a much lon-ger wheelbase than its R8 forebear’s. “This engine is the specifically most powerful diesel there is in the world and, up until now, the biggest challenge that Audi Sport has ever faced in its long history,” said Ulrich Baretzky, head of engine technology at Audi Sport. “There has never been anything remotely comparable. We started development with a clean sheet of paper.” However, he is conveniently forgetting that there are more powerful diesel engines available, but these are used to power oil tankers and the like, and are a little too large and slow revving for Le Mans! R10 successfully completed its first test at the end of November and will take on the 12 hour race at Sebring (USA) on March 18, before heading to Le Mans for the 24 hour on June 17-18. However, rest assured you will never see a massed field of Thailand’s black smoke belching red busses coming down the main straight at Le Mans. Mind you, it is a pity that Thailand has not embraced the European diesel engines for local passenger cars. It would certainly help as far as oil stocks are concerned, and the performance from the road engines is superb these days.